Love is a funny thing. We don’t always know when Cupid’s arrow will strike and sometimes the most unlikely matches make for the strongest, most enduring pairings. It is to this theme that William Shakespeare warms in this classic tale of the odd couple, with some gloriously acerbic and witty lines packed in to this play, as you would expect with old Will at the helm. Much Ado About Nothing is artistic director Tamara Harvey’s directing debut at Theatr Clwyd and she has certainly made her mark here. It’s an intoxicating mix of high drama, romance, comedy and music – all set in the fantastical and lush green surroundings of Portmeirion in a nod to the cult TV series The Prisoner and the theatre’s North Wales base. Tamara has chosen a theatre in the round set up for this production, with the cast holding court on a chess board stage set slap bang in the middle of the imposing Anthony Hopkins Theatre. Some lucky audience members even get to sit at the edge of the action on dainty patio chairs and tables on the edges of the stage, making for the occasional humorous bit of audience/actor interaction as the actors momentarily break through the fourth wall. Soaking up the sights, sounds and even scents of this performance feels a bit like eavesdropping on your posh new neighbours’ summer party, with plenty of suspense and drama unfolding before us. It’s a much needed dose of summer escapism, with some super glam 60s themed dresses and some rather funky music and dancing leading us into an alternate universe of trickery, betrayal and the sometimes rocky path to true love. We are thrown into the maelstrom of a love story that needs a jump start courtesy of Benedick (John Ramm) and Beatrice’s (Lisa Palfrey) determined friends. Will these pals succeed in coaxing two stubborn and independent souls into love’s embrace? Along the way, there are also some magical musical interludes to enjoy, with Catherine Morris turning in a stellar performance as the comical serving woman Margaret. Her beautiful singing voice was mesmerising. The rest of the cast also turned in impressive performances, including Lowri Palfrey as Beatrice’s cousin Hero, Nakay Kpaka as her suitor Claudio, Steven Meo as the conspiring Don John and Sion Pritchard as chief policeman Dogberry. It’s an energetic production, with a fair few costume changes thrown in and some pretty nifty stage design, courtesy of the talented Janet Bird. Well done also to the man behind the captivating music and sound, Richard Hammarton and to choreographer, Joe Walkling for animating proceedings with a fantastic array of uber cool dance moves. 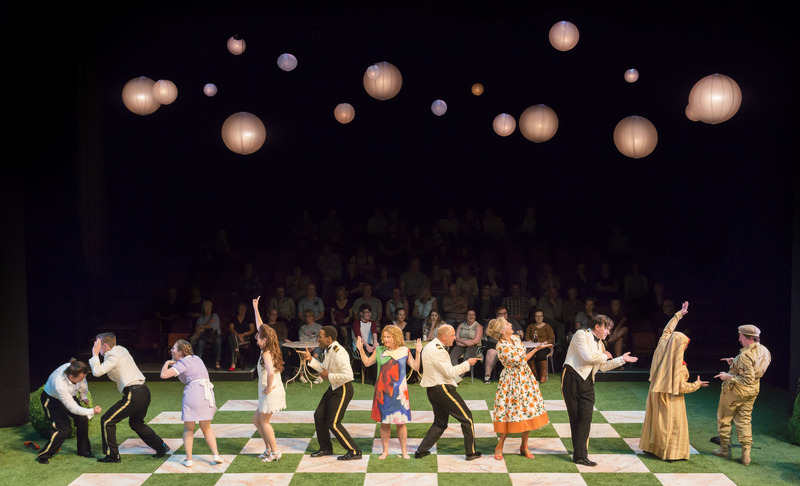 Much Ado About Nothing runs at Theatr Clwyd until Saturday. Catch it if you can. It is an impressive way to mark Shakespeare’s 400th anniversary and the company’s 40th birthday year, along with being Theatr Clwyd’s 400th production.